You are here: Home / Features / Terrific Twelve Canine Movie Stars! Terrific Twelve Canine Movie Stars! Canines never fail to amaze us…their crazy antics, loyalty, faithfulness, companionship, unconditional love…the list is endless. We are also charmed with their natural acting prowess…their eyes speak a thousand words, their expressions are so real and their tricks amuse us. At the 12th anniversary of Dogs & Pups, we bring you twelve of our favourite canine entertainers. 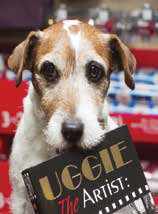 Fame forever: Born in 2002, Uggie was rescued and raised by animal trainer Omar von Muller. He starred in many commercials but his role in Oscar winning movie The Artist was pawsome. 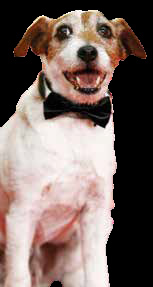 The film won five Academy Awards, including Best Picture in 2012, and Uggie himself was honoured with a Palm Dog Award at Cannes Film Festival. fellow celebrities and his ‘enduring crush’ on Reese Witherspoon. Fame forever: Rin Tin Tin was rescued from a World War I battlefield by an American soldier, Lee Duncan, who nicknamed him ‘Rinty’. He started in Rin Tin Tin, which was an immediate box office hit. He appeared in 27 Hollywood films, including Strongheart. Fast fact: His legacy was taken forward by his son Rin Tin Tin, Jr. and later his grandson Rin Tin Tin III and Rin Tin Tin IV. Fame forever: Spike was rescued from a shelter by animal trainer Frank Weatherwax. Old Yeller is probably the perfect movie to shed some tears for human’s best friend. The movie is based on a Newberry Honor-winning book by the same name written by Fred Gipson. Spike as Old Yeller, steals the show while saving his family from a rabid wolf. He gets bitten in the process and has to be put down. Fast fact: Spiike also appeared in TV series like The Mickey Mouse Club, Lassie and The Westerner. Breed: Mix of Miniature Poodle, Cocker Spaniel, and Schnauzer. Fame forever: The animal trainer Frank Inn rescued him as a puppy from animal shelter. He was a stunner in the popular television sitcom Petticot Junction. He was very popular for his ability to convey a broad range of emotions through his facial expressions. He could even yawn and sneeze on cue. His most famous movie remains Benji The Hunted. What’s more? He won a Patsy Award in 1967, and was cover-featured in an issue of TV Guide magazine. 05- Leyla, Chico and Forres – loyalty personified! Fame Forever: Hachiko: A Dog’s Tale is based on a real life story of a dog who meets his pet parent at the train station whenever he leaves and arrives back from work. One day, the pet parent dies and never returns home but Hachiko spends his 10 years of life, waiting for his master to arrive. Definitely, the best example of loyalty! Fast fact: In the movie, the role of Hachi was played by three Akitas – Leyla, Chico and Forrest. Mark Harden, who trained these three dogs, later adopted Chico as they both became too fond of each other. Chico portrayed Hachi as a young adult, while Layla played adult Hachi and Forrest played old, dying Hachi. Fame forever: Beasley was born in a dog kennel in Merrimac, Wisconsin and was trained by Clint Rowe. He only acted in one movie – Turner & Hooch. This big cute dog is way into everyone’s hearts through his crazy antics, romantic liaison and loyalty. Fast fact: In an episode of Late Night with Conan O’Brien, O’Brien gave Tom Hanks a preserved dog skeleton, claiming it was Hooch. 07- Clyde – cuteness redefined! Fame forever: The naughty little Labrador in Marley & Me is clyde, who is actually very naughty and likes to rip things apart. He is trained by Mark Forbes. This beautiful film can even make a non-dog lover cry! Fast fact: Since the movie shows 14 years of life of Marley, 22 different yellow Labradors played the role. 08- Pal – the best pal you can have! Fame forever: Pal was trained by Frank and Rudd Weatherwax and was the first dog to play Lassie on screen. The Lassie series of movies continued with new paw stars playing Lassie. Fast fact: Although Lassie was a female in the movie, Pal was a male. It was because males are larger than females and look good onscreen. 09- Chris – adorable gentle giant! Fame Forever: Chris was trained by Karl Lewis Miller. Beethoven is by far one of the most beautiful movies with a paw star. This huge dog has a rough beginning in the movie, but he soon becomes a valuable member of the family. When Beethoven’s life is at risk, the family can’t bear to be without him. Sadly, Chris passed after the sequel of the movie. Fast Fact: The movie was so popular, that it had seven sequels and one animated TV series. Chris starred in the second Beethoven movie as well. 10- Buddy – the best buddy! Fame Forever: Buddy was a stray, until Kevin di Cicco found him and trained him in sports like basketball, baseball, football, soccer, hockey and chess. He first appeared on America’s Funniest Home Videos. He debuted as a star in Full House as Comet, and later Fluke. He became a favourite with his film Air Bud. Fast Fact: Buddy dies due to cancer and had his right hind leg amputated. His story is told in the book Go Buddy! Written by his pet parents. Fame forever: Terry was owned and trained by Carl Spitz. Terry did her own stunts in the movies and almost lost her life during one of the scenes in The Wizard of Oz. She starred in as many as 16 movies, but the most popular remains The Wizard of Oz. She gave birth to Rommy, who later starred in movies like Read the Wild Wind and Air Force. Fast Fact: Terry’s salary was $125 per week, even more than human stars in the film at that time. 12- Max – maximum fun! Fame Forever: Max played Milo in the The Mask. This was his debut film and several scenes had to be changed because he did not at in the way he was required. But, the movie was a big hit and people loved Milo. Max also played the female dog Audrey in Mr Accident. Fast Fact: After the success of the film, an animated series The Mask: The Animated Series was released. Milo’s voice was given by Frank Welker, who has voiced many other dog characters, including Scooby-Doo, Droopy the Dog and Santa’s Little Helper. http://www.dogsandpupsmagazine.com/wp-content/uploads/2016/07/Untitled-17.jpg 130 230 Dogs and pups Magazine http://www.dogsandpupsmagazine.com/wp-content/uploads/2017/05/1254nal.jpg Dogs and pups Magazine2016-07-16 12:24:492016-07-16 12:59:24Terrific Twelve Canine Movie Stars! Dogs & Pups, May-June-2016 Issue Celebrating 12 Years of Pawsomeness!